You are here: Home / Directors / My Son Didn’t Want to go Back to Camp a 2nd Summer. Here’s What Happened When He Did. Well, the ironies just keep piling up for me. 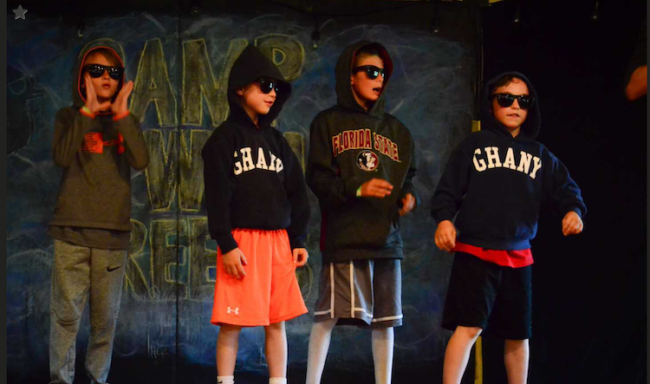 First I’m the director of an all-girls camp and yet I personally have three boys! Then, in spite of my full conviction about the value of summer camp, my own son came to me before his second summer at camp saying that he didn’t want to go back because he felt out of step with some things there and he didn’t want to feel that way. Boy did I have my work cut out for me! First off, Mason was going back to camp. As much as I cared about his feelings, this wasn’t a negotiation. It was an exploration. I know from my own years at camp, his first experience at camp (which was overwhelmingly positive), and my years as a camp administrator and now director, that his sleepaway summer camp was a great choice for him and that his second summer would be wonderful. But how to get him on the same page? As I wrote in my blog series, “From Camp Director to Camp Parent,” my oldest son Mason went to camp for one week as a 6-year-old, rising first grader. Since the camp I picked out for him has a one-week program, and I wanted Mason to start with that, I took a tour with my husband Matt to check it out. Then I decided that, even though I hadn’t really thought to send him as young as age six, that since the directors told me they’d happily take a six-year old, we felt that Mason’s positive experiences at our camp as a young child made us feel confident about going for it. In that first one-week summer he had some true moments of missing home, and some tough moments — he didn’t pass the swim test for example. And then there were some rainy days that changed the routine, so overall he spent the week trying to get his bearings on this new environment. Now, he came home happy and full of positive stories, which was great. So we talked about going back to camp the next summer, and decided together to go ahead and sign up for two weeks this time, instead of the one-week program. But as the months wore on, his excitement waned, and then as summer neared he started to get a little anxious about going. The night before he went for his second summer, he actually cried in bed and said he didn’t want to go. Talk about breaking Mommy’s heart! On that last point I have to emphasize that this is totally a child’s perspective — at Mason’s camp and our camp and every accredited camp I know, there are adults around all the time! Mason was talking about moments like brushing his teeth and showering without mom’s help. That was new to him, and should be! They do things differently because it’s a different camp. Since you went for one-week after camp was already in session, the other kids had been there for a week — that’s why they knew what was going on. Brushing your teeth and taking a shower are things that the adults don’t need to help you with even though they’re nearby. When we talked specifically about the concept of independence, like for the tooth brushing, or even being on his own away from his family, there was definitely a lightbulb that went on in his mind. It was an age-appropriate hesitation that harbors a very small amount of natural anxiety — like the separation anxiety a baby feels at six-months or so, but this was the early childhood version. A kind of uncertainty about what all this “independence” stuff means. Is it good? Scary? Fun? Exciting? Worrying? Adventurous? It’s all of those things in just the proper dose. I knew he was questioning going back to his camp, but I also knew (because I KNOW the ages and stages and developmental aspects of childhood for doing my job effectively in planning and in communicating with parents) that Mason needed to give camp a second chance. And like I said above, I wasn’t going to budge on that. But Mason was a child. A sensitive, connected, loving child and his own concerns were valid and meaningful. So we took a gentle approach, never conveying that he would be “forced” to go back, or putting any heavy energy on his questions and our interactions. It remained a gentle exploration of feelings and ideas and realities. A huge piece for us was helping Mason to feel that for his second summer, he’d be right in line with everyone else. We explained that the one-week program starts right in the middle of one of their regular two-week sessions, so this time, like everyone else, he would, “know what was going on!” That pleased him and broke some ice. As a side note with my camp director’s camp on, I see that kids do much better at camp when they stay longer. Although our Mini Camp program is excellent, and helps girls (or maybe it’s their parents) dip a toe into the water of camp if they’re unsure about it, one week isn’t always long enough for camp to really become a part of the child. 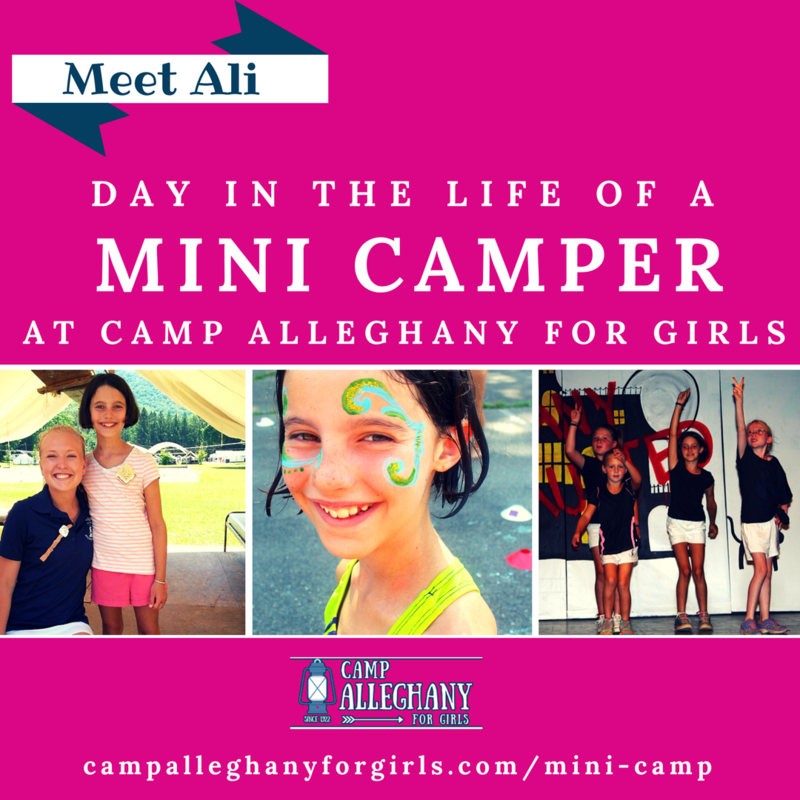 Mini Camp has many amazing benefits and truly helps so many girls become ‘Ghany Girls. But we do see this trend at Alleghany where campers who come for the first time ever as three-week Term Campers have a much deeper bonding experience that then translates to a higher rate of returning to camp in subsequent years (when older girls need camp just as much) than we see Mini Campers who make the leap to Term Camp. Fascinating, right? All along we were addressing Mason’s occasional questions, working with his concerns, and helping to develop in him a sense of being a worrier verses being a warrior. We wanted to quiet his worrying by honestly addressing it as a valid emotional exploration while equipping him to be a warrior (to step forth into the challenge with confidence) through giving him tools of honesty, clarity, and validation. Fast forward to the opening day of his second summer at camp. Our whole family is, of course, at Camp Alleghany in the summer, from which I scheduled some time off to be able to drop Mason off at camp with the family. That morning — the night after he had cried and said he really didn’t want to go back — he woke up with renewed confidence. He understood the plans weren’t going to change, so he was ready to face the challenge. When we got to camp, I saw him excited to get back in the groove, and we had no fears when we left. He was off for two weeks, and we never looked back! What a success! From the letters he wrote, to the pictures posted, to the stories and snippets I got from the directors over there, what a counterpoint to his stated aversion! What resilience! What adaptability! And what true courage! He was our true Mason — smart, polite, goofy, confident, happy, silly, jumping into everything feet first. I could tell as only a mother can that my instincts were right on — he was hooked, and having the time of his life! I knew (because I KNOW as a camp director) that he needed that second summer, that second chance, where now he’s not new, he’s there at the start, he knows the ropes, and he can just jump in. By being there for two weeks, camp was so much more a part of his life, his summer, his identity. And deep down I had the sneaking feeling that when we got there on closing day he’d ask to stay another two weeks. He almost did! His counselors told me he talked about it all two weeks, but then toward the end got a little tired/worn out and decided to come back to Camp Alleghany with his family and do a longer camp session in the future. During this year at school Mason has been an even better version of his already lovable self! He was so confident, happy, mature… the list goes on. Little worries and pressures and fears he had during first grade about getting to school even one second after the bell rang don’t exist anymore. I know this also comes with age and time and experiences, but it’s like it happened overnight, and I truly believe it came from being equipped in his camp experience to be a warrior and not a worrier. If I had given in and let him just stay home… what then? It’s so important to always give sleepaway summer camp a second chance. Some kids take to camp right away, clamoring to come back the next summer. But for others, for many, that first year can simply be a time of figuring things out, getting your bearings, finding yourself in a new way apart from mom and dad and what’s familiar. Since camp is such a crucial part of a child’s whole education, and often their only extended time in nature and away from media, if you never give camp a second chance, how will you know how she’ll react or grow or change in a positive way? In this sense, it’s important to not only see camp as individual summers, but to see the camp experience as an arc over time during a child’s development, feeding different parts of them, and nurturing their growth over time. 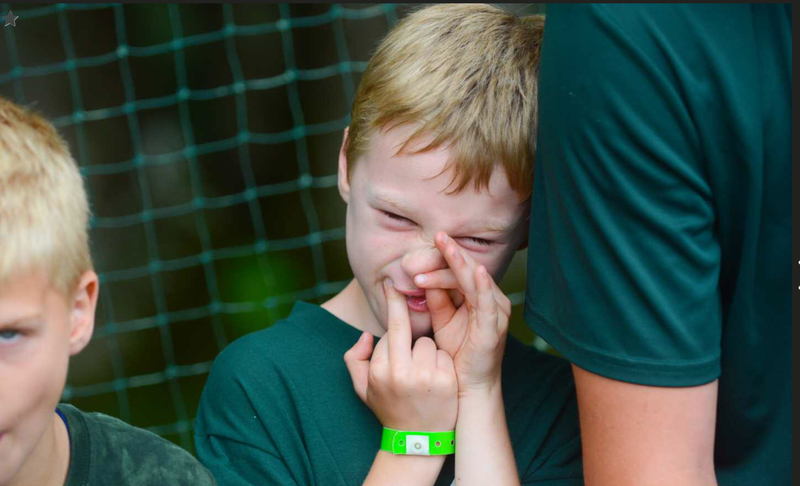 One final note I’d like to add is that, because of my confidence in the summer camp experience, Mason went to his first sleepaway year as a rising first grader, a kind of unusual thing. At Alleghany we don’t take campers until they’re a rising second grader. Observing Mason’s two different experiences at those two different ages sort of sealed the deal for me on our decision to start Alleghany after first grade, and validated that it’s the right age to start Mini and Term Camp at ‘Ghany. Now of course, we do allow five-year-olds at Mother-Daughter Weekend (ages 5-10), so that is another way to dip a toe in the water of camp. Like you, this test I got with Mason’s feelings showed me that I’m living and learning — combining motherhood with promoting the good things that I know camp to be. I know sleepaway summer camp is a good thing from my own camp days, my child’s experiences, and seeing wonderful girls thrive at Camp Alleghany for Girls, just as they have for almost 100 years! We hope we’ll see your girl at camp. 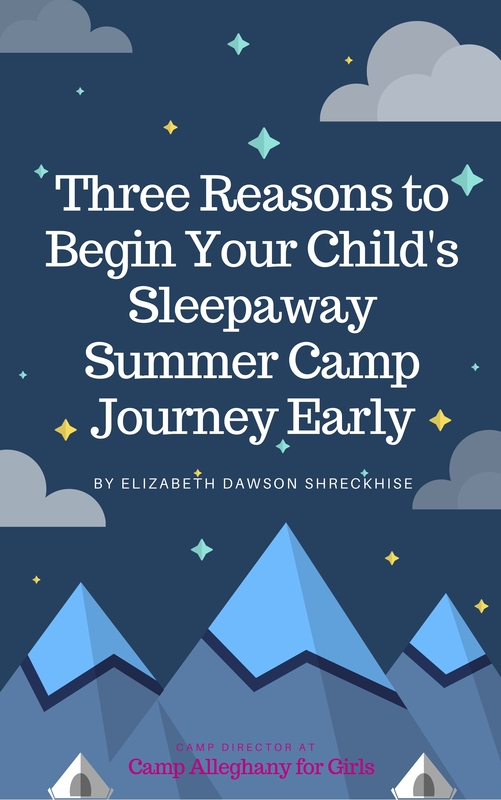 If you want to hear more about the merits of sleepaway summer camp, download my FREE e-book, 3 Reasons to Begin Your Child’s Sleepaway Summer Camp Experience Early. 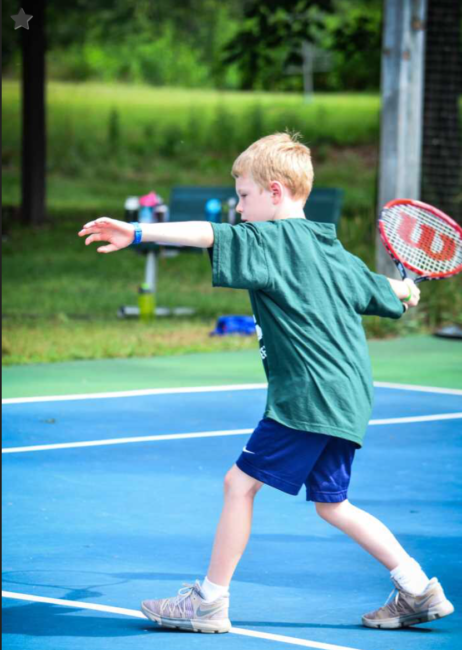 It’s a great resource to share with friends, or if you are a first-time camp family and you wonder what sleepaway camp would be like for your child.